Nandyal (NDL) railway station is one of the famous station of Andhra Pradesh due to its geographic location. A lot of tourists visit the place every year not only to visit attractions of Nandyal, but also to visit famous nearby places such as Ahobilam, Yaganti and Srisailam. It is a major station on the Guntur division of South Central Railway. It acts as the main source of travel for the people of Nandyal, who work at multi nationals like IBM, Oracle and Accenture in various cities including Bangalore and Hyderabad as it has direct trains to Bengaluru, Secunderabad and Howrah. Nandyal station was built in 1890 during the British Era. Constructions of this station lead to the boom of the economy and trade here. A lot of meetings were held here during the fight for freedom and very famous people visited the place as it was accessible by train at that time. Some of the known visitors include Jawahar Lal Nehru, Indira Gandhi, Mahatma Gandhi and Raiv Gandhi among all the visitors. A new line to Yerraguntla is under construction. 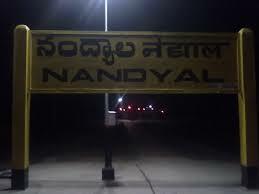 Just like any other station of the country, a lot of facilities are offered by the Nandyal Railway Station. There is a Tourist Information Centre located here for the ease of passengers. A Computer Reservation Office is also located here for the travelers who prefer to book their tickets online. Waiting Room and Retiring Room are also available for the simplicity of all the commuters. And for the relaxation of all the travelers tea stalls, light refreshment, veg refreshment and book stalls are also offered here. A lot of places to stay and eat are located around the station for convenience of travelers from all around the world. Hundreds of people travel up and down daily through this junction. Nandyal has direct rail connectivity to important cities throughout the country including Vijayawada, Howrah, Goa, Guntakal, Bangalore, Anantapur, and Hubli. Two trains including Amravati Express and Goa Howrah Express run from Nandyal to Hyderabad. As a lot of people of Nandyal works in Bangalore now a days, there are three trains available for these commuters including Puri Bangalore Gulbarga Special, Machelipatnam Bangalore Express and Prashanthi Express. Goa Howrah Express runs from Nandyal to Kolkata for all travelers of Kolkata.Though there is no connectivity to Mumbai but one train is available for Gujarat and Madhya Pradesh / Rajasthan.